Whether you’re just getting started or you’re an experienced gardener, Designing with Succulents by Debra Lee Baldwin will inspire you to go outside and look at you garden with new eyes. The book is loaded with color photographs and the plants are identified in the captions with their botanical names which is essential if you want to replicate the plantings in your own yard. The book begins with the basics of landscape design. It is important to be aware of how shadows shift with the seasons, what type of soil you have and how you will address the irrigation needs of your plants. It then moves into the more artistic elements of landscape design – scale and proportion, repetition and contrast of textures and colors. Not only does the book include many ideas for in-ground gardens, there is a chapter on pots, wreaths and containers. If you like succulent wreaths, there are detailed directions for making one and a beautiful photo of a succulent topiary ball. A chapter on plant care and propagation covers the fundamentals including dealing with mealy bugs and scale. If you’re interested in color, there is a list of succulents organized by leaf color and another list of plants with the brightest flowers. There are also chapters in which succulents are organized by size and suggestions for companion plants which will grow well in the soil and water conditions that are conducive to maintaining a healthy succulent garden. I especially liked the chapter on low-growing succulents that gave brief descriptions of the major types, including water and sun requirements. There was also a page devoted to distinguishing aloes from agaves. Although most of the photographs were taken in Southern California, there is a chapter that deals with growing succulents in colder climates. It includes a list of cold-hardy plants and directions for gradually transitioning non-cold hardy plants indoors for the winter. 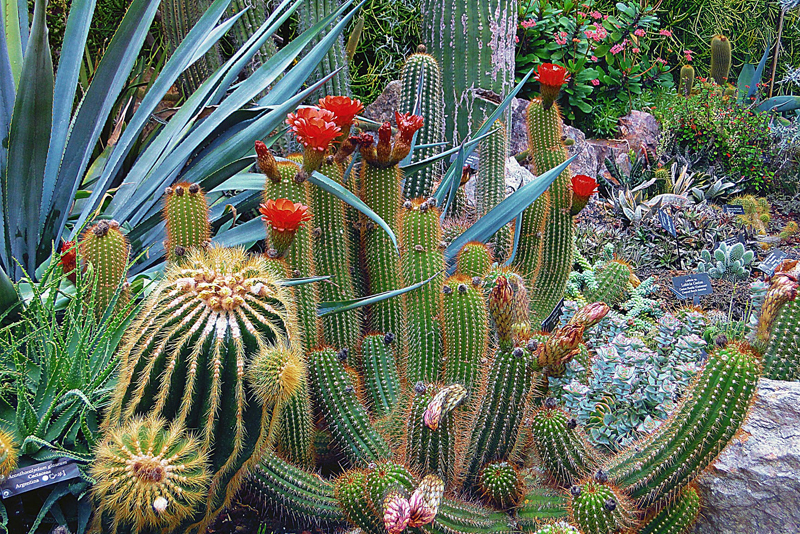 The book ends with a resource list that includes a list of succulent gardens open to the public - mainly in the Southwest United States. A bibliography lists many books which will give you even more information and an index will help you find the picture or text you want to review. I checked this book out of the public library and after reading it, I plan to purchase my own copy to have for a reference. When the weather isn’t the best for spending time outdoors, I can take a vicarious stroll through a beautiful garden as I peruse the photos in this book. It is available at the major booksellers and can also be downloaded for the Kindle.